Fluorescent light fittings to LED is not difficult. Fluorescent light fittings to LED can easily be altered in just a few minutes. 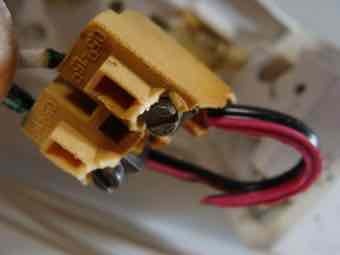 Remember though you are dealing with potentially dangerous voltages, so it's best to turn off the mains breaker. 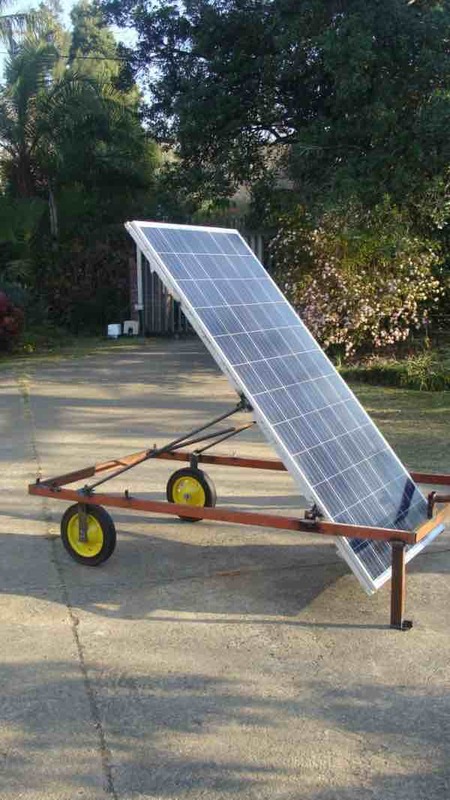 This blog is part of a general series on going green; in short using less energy in the home, and in particular through the use of the power from the sun. Light emitting diode lamps use much less electricity than the old conventional lights. Why would you want to do this in any case? Firstly a LED tube draws less than half the current of a conventional appliance. Then you don't need a starter, or a ballast; they draw a lot of energy when turning the light on. They tend to burn out eventually too, and need to be replaced. The LED is much simpler. If you are putting up a new light fitting, then the holder is much cheaper, but the LED tube considerably more expensive. But then it will last a lot longer. Ours are now four years old and working without a hitch. Then there's no dangerous mercury vapour in the LED tube; if you accidentally break the fluorescent kind, you couldly serious poison yourself and the environment. This is the basic wiring diagram and, as you can see, it's ridiculously simple. This is for a two tube holder. 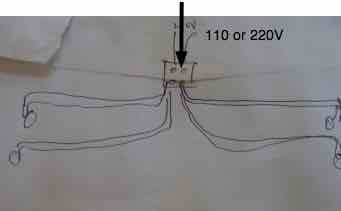 The two wires that come out of the left socket both go to either live or neutral, and the two wires from the right socket go to the other. LED fittings will work off 110V or 220V. But inside the existing old flurorescent tube holder there will be a mass of wires; never fear, this is ridiculously simple. 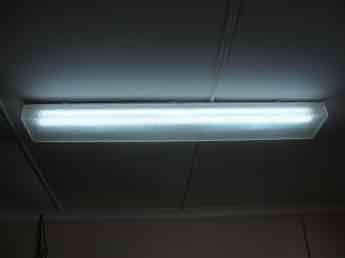 Changing fluorescent light fittings to LED can be done in five minutes. Flick down the mains breaker. 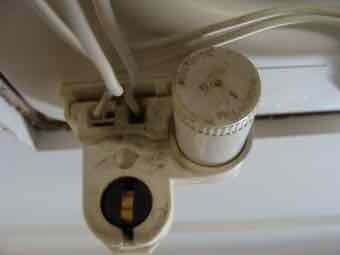 Get a ladder and remove firstly the diffuser, if there is one, and then the old existing fluorescent tube. There is probably a starter; remove it. Here it is sans the starter. Newer ones don't have a starter. This is a very old fitting, 35 years, so it's grubby but easily switched to LED. Look around for the ballast; it's a rectangular box, about 10cm long. If you are using a double tube holder there will be two ballasts. You have to do both. 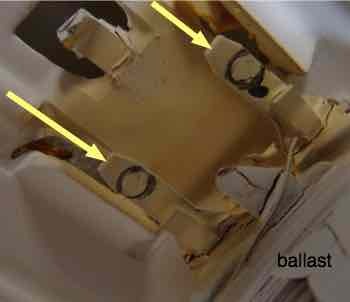 Identify the ballast, and the two wires running into it, where the yellow arrows are seen below. There will some sort of connector; these have black circles drawn on them for some reason known to the manufacturer only. Unscrew or unplug them. Stay with me because changing fluorescent light fittings to LED really is ridiculously simple. Cut a short length of single core wire, say 5 to 10 mm long and strip off the covering from each end. 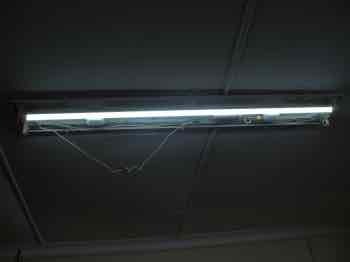 It can be very thin as these LED tubes draw only 18 watts. Roughly one tenth of an amp on 220 volts mains, double that if you are in America and on 110 V.
That's one of the savings of light emitting diode lamps; all the wiring is much thinner as the current is so low. This is a bit confusing; I'm sorry. I used a bit of double flex; you'll see the red has no wire in it. Only single core is necessary. This connector attaching the wiring to the ballast is very old and started falling apart when I undid the screws; never mind, it's still functional. Simply connect the one end of your length of wire into the right side, and the other into the left. Make sure the screws are tight and there's no possibility of a loose filament of copper touching the chassis. And Bob's your uncle, you're done. Tidy up the wires; as you can see in the first photo they may be hanging loose. 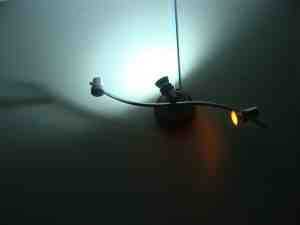 Replace the diffuser if there is one, flick on the mains, then the light switch and, hey presto, let the be LED light. These LED tubes are expensive; around $50. Manufacturers claim they will last 50,000 hours but I'm skeptical. My oldest fittings are four years old. That's about 10,000 hours. 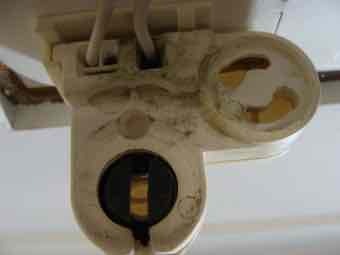 If you get mains surges periodically it may blow the electronics in the LED fittings. We have an inverter connected to our solar generator, and it produces very pure sine wave with almost no voltage fluctuation, reducing the problem. None of our LED tubes have blown yet; they seem to have better protection that the ordinary bulbs. Do remember that whilst converting fluorescent light fittings to LED isn't rocket science, electricity does kill if you do silly things. These days with earth leakage protectors, you'll just get a jolt. I always turn off the mains when working with electricity; a qualified electrician wouldn't do that, but he's a professional, and we're hackers, right?! Now for the rest of your light bulbs. LED globes come with all the different fittings today, whether ES screw or bayonet. When you buy LED light bulbs you'll find it's quite routine. They do cost more, but last much longer, and use a fraction of the power. Make sure you choose the right intensity. Bright is bright! 3-6 watts is usually adequate for inside the house. 20W for outside floodlights. Solar power energy comes for free but, mindful of the cost of harvesting and storing it, it's important to change over to energy saving devices like LED lights and, below, an induction stove. Having half a dozen ordinary lamps on all evening will drain the average battery pack, so make sure you learn how to change conventional fluorescent light fittings to LED light bulbs. 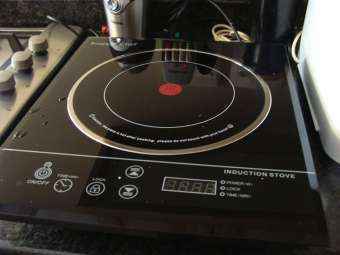 Whether you want to reduce your electrical consumption because you've become a greenie, or you simply want to reduce your electrical bill, the next step after changing your incandescent and fluorescent light fittings to LED, is to buy an induction stove. These little induction cooktop stoves are magic; they take up a small amount of room next to your gas or regular hob. They use less than half the power of a conventional plate, and work at twice the speed. In fact they are significantly faster than gas. By using the bottom of your pot as the element, you have instant heat. I've seen them from $30 - 100. Worth every cent, if only for the convenience of their speed. But they don't work with copper or aluminium bottom pots. Bernard Preston is not an electrician but had to work out how to change fluorescent light fittings to LED to reduce the load on his solar generator; but in fact we should all do this next time a neon tube blows. You could do it too; fluorescent light fittings to LED is not rocket science. A new product is in development; watch this space. 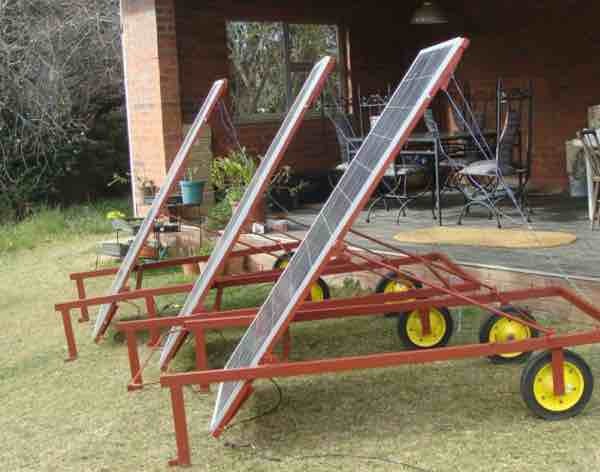 Just one of these mobile solar panels and two 12V batteries will run your LED light fittings all night, but I recommend you go for at least three so you can power your computer too. One or two batteries of choice. This however is not what I recommend; you WILL want to grow it; but it would run your lights and a laptop. Mark I above had a fairly serious drawback; see the shadows cast on the panels by the transverse bar and handles? I have moved them both, now using a removable one, and in fact eventually ditched it completely. It's so light that you can turn it several times a day to keep facing the sun. Return to day in the life of solar geek Bernard Preston page. I blog this website really for the fun of sharing the joys of being a greenie, and the power of chiropractic. If you find these pages interesting, then you are sure to enjoy one of my books.